Well lets start with Avoriaz. Perhaps encouraged by the resorts continuous ranking in world snow record tables, there seems to be plenty to get excited about in Avoriaz this winter. The Brochaux chair is that one that takes you back towards Avoriaz from the bottom of the Mossettes lift. It’s rickerty old 3 man, popular with snowboarders who don’t fancy the Mossettes flats into the Lindarets bowl. Its 6 man replacement should make the charge back into Avoriaz at the end of the ski day much easier for everyone too. There’ll be new base and top stations too. The base moves by 30 metres and the top station lands 280 metres east of the ridge. Morzine – well, not so much a new chairlift, but some improvements. Remember the bridge you have to go through to get back to the Fys chairlift and make your way back to Morzine…. yes, we all hate that one. 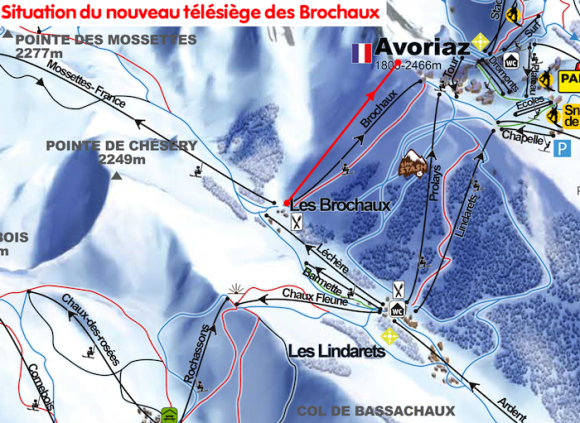 Well they are now going to elevate the chairlift, Le Pre Favre and improve that area, so we no longer have to use the bridge!! Can’t wait for that! As for Les Gets…. I think it will be 2017 when we see their changes!